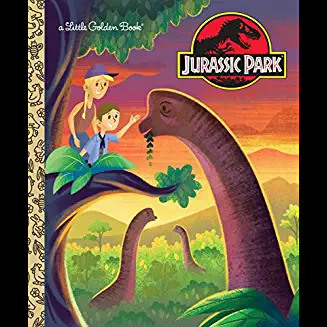 Last year, I wrote a children’s book called the Jurassic Park Little Golden Book, which was published by Penguin Random House in February 2018. That’s right, it’s an adaptation of the 1993 film Jurassic Park, written as a Little Golden Book. And now, to celebrate the 25th anniversary of that 1993 movie, The Jurassic Park LGB will be read in Barnes and Nobles across the country on Sat 6/23 @ 11am! Visit your local Barnes & Noble for a Jurassic Park Storytime Event. Details HERE. The Jurassic Park LGB is one of a trio of Little Golden Books I’ve written for PRH. First I wrote the Doctor Strange Little Golden Book, which came out in January 2017. 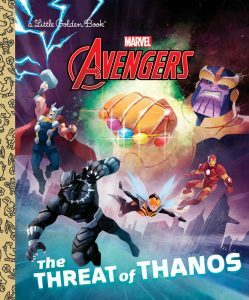 Then I wrote The Threat of Thanos, an Avengers Little Golden Book, which comes out in July 2018. Which scenes absolutely need to be in the book, given its very specific page count and word count? Which scenes can be tossed out? Which characters absolutely need to stay, and which characters simply won’t appear in the Little Golden Books version of this story? Many of the scenes in this book are going to revolve around the adult characters. But which scenes can be viewed through the eyes of Lex and Tim, the two characters in the movie who are – you know – actual kids, and therefore close in age to the audience demographic for this book? The movie has many suspenseful scenes, and it’s got a bit of a “horror movie” vibe. Which of course isn’t a bad thing; it’s what the movie is going for. But I can’t give a Little Golden Book a “horror movie” vibe. So I also had to think about which of those edge-of-your-seat scenes can be turned into slapstick-heavy, action-packed, wacky scenes. Like the scene where Lex and Tim are hiding from the velociraptors in the cafeteria section of the Visitors Center. That scene is a real nail-biter in the movie, but everything that makes the scene suspenseful in the movie had to be tweaked so that it was funny. For example, there’s that moment in the cafeteria scene where the raptor sees Lex’s reflection in a metal cabinet, and the raptor slams into the cabinet, thinking that the reflection IS Lex? That scene is pretty frightening in the movie. In the Little Golden Book, it’s just pure slapstick, and the raptor might as well be Wile E. Coyote. Also, I had to really emphasize the fact that Tim and Lex outsmart and outmaneuver the velociraptors. In the movie version of the cafeteria scene, Tim and Lex get pretty frightened. Which is understandable. But in the Little Golden Book version of that scene, they’re totally calm, never letting the velociraptors rankle them too much. If Tim and Lex aren’t scared by this situation, the reader wouldn’t be either. Samuel L. Jackson gives an AMAZING performance in Jurassic Park. He has this one scene where he’s smoking a cigarette and his mouth is mostly closed while he delivers this 20-second monologue, and he just crushes it. But his character didn’t make it into the Little Golden Book version of the story, mainly due to lack of space. Jeff Goldblum is also incredible in Jurassic Park. His character DID make it into the Little Golden Book. I think the book really turned out well and I’m quite proud of it. It was illustrated by Josh Holtsclaw, who did an incredible job. I’m hoping that I get to write more Little Golden Books, because they’re great fun to work on. I should probably also mention that I’m listening to John Williams’ Jurassic Park soundtrack while writing this blog post. But you knew that already, didn’t you? Jewish Comic Con THIS SUNDAY & NEW Interview On The Beat! This Sunday, April 29th, 2018, I’ll be one of the special guests at the Jewish Comic Con in Brooklyn. (More info here: http://jewishcomiccon.org/) The Jewish Comic Con is a great event, and I’ll be co-moderating many of the panels with Danny Fingeroth. Also, I was interviewed by the amazing AJ Frost, Staff Writer for the “geek culture” site THE BEAT. You can check out the interview here. And a LEGO STAR WARS book (it’s the third LSW book I’ve written so far), titled THE OFFICIAL FORCE TRAINING MANUAL, which comes out in October 2018 from Scholastic.